One of the most popular classic adventure game series 'Broken Sword' is coming up with a new game. 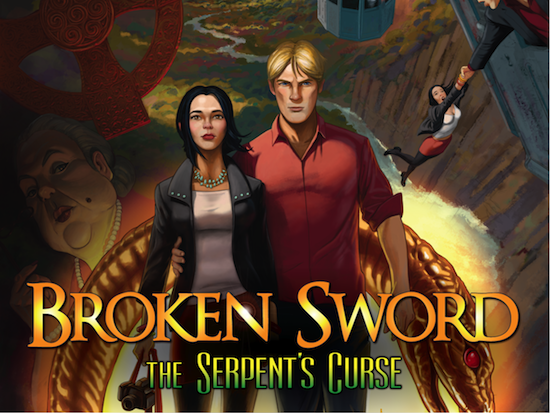 Titled 'Broken Sword - The Serpent's Curse Adventure', the game is currently on kickstarter. The series has such a huge fan following that it has raised around $130k in less than 24 hours. The last 4 games in Broken Sword series have won numerous game awards. Broken Sword is a point and click adventure game starring unwilling hero George Stobbart, an intrepid American lawyer, and Nico Collard, a sassy French freelance journalist. When a mysterious painting is stolen during an armed raid on a Paris gallery, George and Nico are thrown by chance into the investigation together. From Paris to London and beyond, the trail becomes a race against time as dark forces from Europe's turbulent past are woken from their slumber. Broken Sword characters old and new are encountered - but who can George and Nico trust? The journey they are on reveals a conspiracy as old as the written word, whose ancient heresies will cause innocent blood to spill once more. Linux support has been confirmed for the game from day one, no stretch goals, no conditions. For $15, you can grab a copy for yourself. The game is expected to be released in April 2013, head over to kickstarter for more info.